First floor: Open plan kitchen/diner/living room (fireplace, TV, DVD, CD, oven, microwave, dishwasher). Cloakroom. Telephone (incoming and local calls). WiFi. Central heating throughout the house (payable locally). Second floor: Double bedroom. Twin bedroom. Shower room with separate cloakroom. Outside: Lawned garden. Summer kitchen (shower room, fridge, sink, oven, microwave) with decked terrace overlooking the pool. Built-in barbecue. Table tennis. Private courtyard. Garage. Private parking. Private heated* swimming pool (8m x 4m) with Roman steps. The undulating countryside north of the River Lot is dotted with chestnut woods and stone villages. In a tiny hamlet, close to the border with the Dordogne (3km), sits La Maison Fleurie, a picturesque stone cottage, adorned with pots of colourful flowers. External stone steps lead up from the courtyard to the first floor terrace, which leads into the open plan living accommodation. The original inglenook fireplace, set against open faced walls defines the sitting area, whilst the kitchen and dining table sit neatly at the other end. The two bedrooms are found on the second floor in the eaves of the roof where substantial wooden cross beams are in evidence. Beyond the courtyard, effectively divided by a stone barn, recently transformed into a summer kitchen, lies the pool in a well established garden. Edged by rows of flowers and with views over the surrounding countryside, it is a secluded situation. A typical 'ferme auberge' (country restaurant) is within walking distance (800m) of La Maison Fleurie. Essential amenities including a restaurant can be found in Frayssinet-le-Gélat (4km), as well as a lake offering fishing, with tennis courts and café on the waterfront. Due north is the bastide town of Villefranche-du-Périgord (7km), whilst the well preserved châteaux of Bonaguil, Biron, Beynac and Castelnaud all make for a rewarding visit. *The pool can be heated (payable locally) - please request at least one week prior to your stay. Come for a walk with us! The owners of Maison Fleurie propose a 1h30 walk, every Monday at 17:30, during which they will take you along secret lanes and woodland. Easy walk, accessible to all and completely free! is in a delightful little hamlet with pretty flowers and rustic charm - friendly locals too! stroll down to the Ferme-Auberge just 800 metres from the house for a delicious meal of local specialities. After all, you are on holiday. this is the ideal place. Just in front of your house you will see signposts indicating the directions for several beautiful walks that lead right from your doorstep. You will find leaflets on the walks in the house. Visit the nearby fortress of Bonaguil. Elevated above the oak woods it appears to have no strategic reason for being there except for our magical pleasure. You can enjoy a tasty meal followed by a long walk in the surrounding countryside. In summer this chateau is a venue for Theatre festivals and classical music concerts. and there are plenty more on this side of the Dordogne including the Chateau de Beynac, the Fortress of Castelnau and its medieval war museum, the garden of the Chateau de Marqueyssac that overlooks Laroque-Gageac and the Dordogne valley and the nearby Chateau de Biron, set in a beautiful village. jewel of the Dordogne is about an hour away. Why not visit this town on market day, Saturday, and then visit the Lascaux caves a little further north to see the famous paintings? on the River Lot at Anglars-Juillac (16 kms). You can also go kayaking here, hire a small motor boat, rent a bike and go for walks. to be found in the village of Frayssinet-le-Gélat, 4km away. Choose from horse riding, tennis, fishing as well as boating on the picturesque lake, or walking in the woods that surround it. to the Parc-en-Ciel in Lacapelle-Biron (29km) - 14 hectares of trees and fields where you'll find mini golf, a farm of baby animals, a snail museum, and an adventure playground through the trees with different courses suited to the age of the children. Golfers can play a round at one of two courses in Siorac (25km). a small and attractive market town with little winding lanes and some lovely houses (52km). Visit the aquarium and the reconstitution of a XIXth century village at the 'Village du Bournat'. around Puy l'Evêque (12km) and try the dark Cahors wine, a largely undiscovered great wine of the region. You will see many 'caves' selling the wine and most will offer the chance to taste it first. Don't forget to stop in the little villages en route as well - there are many dotted along the River Lot down to Cahors (40km). were mostly built around the Lot valley and the Dordogne. They are generally buzzing places, with lively markets and little cafes, excellent restaurants and pretty shops all around. Near La Maison Fleurie, you will find many bastides nearby including Villefranche-du-Périgord, Monpazier and Monflanquin. is a visit to the remote hamlet of Les Arques (17km) in the Lot. Visit the Zadkine Museum, with exhibitions by the Russian sculptor who made this tiny village his home. Whilst there you must enjoy a delicious meal in the much-acclaimed 'La Recreation' restaurant converted from the old school house. built on the side of a cliff. In the 13th century pilgrims would flock here in their thousands to seek cures for their illnesses. The children will enjoy seeing the eagles fly off the Roc or watch the 130 monkeys who live completely free in the Foret des Singes. It's famous for its goat's cheese so make sure to take some home with you. (Gouffre means chasm) just 25km from Rocamadour, you can take a boat ride 300 feet below the surface of the earth and a walking tour amongst the stalactites and stalagmites, one of which is over 300 metres high and took several million years to form ! passing Cahors, will take you to St Cirq Lapopie, a village with the accolade of 'Un des Plus Beaux Villages de France'. A very impressive place with a view to match. Best visited late afternoon, early evening when the tour buses have left. 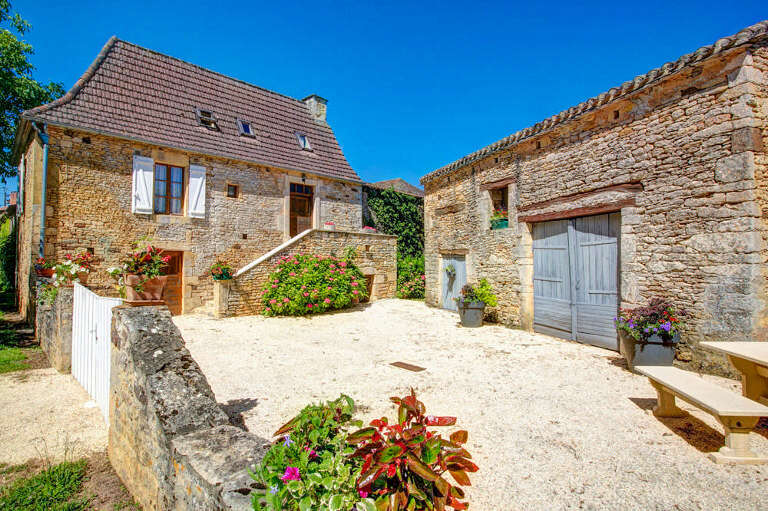 there is lots to see and do in the area around Maison Fleurie, but if you just want to chill out at times, relax around your pool and summer kitchen, enjoying the rural view and the tasty local fresh produce. The aeroclub in Belvès (30 km away) offers plane trips above the famous sites and chateaux of the Dordogne.